When it comes to deciding how to split your digital ad spend, things can get complicated given how many aspects of digital needs to be considered. However, a recent report by market research company eMarketer has found mobile ad spending to rise in the next five years from 2017 to 2021. 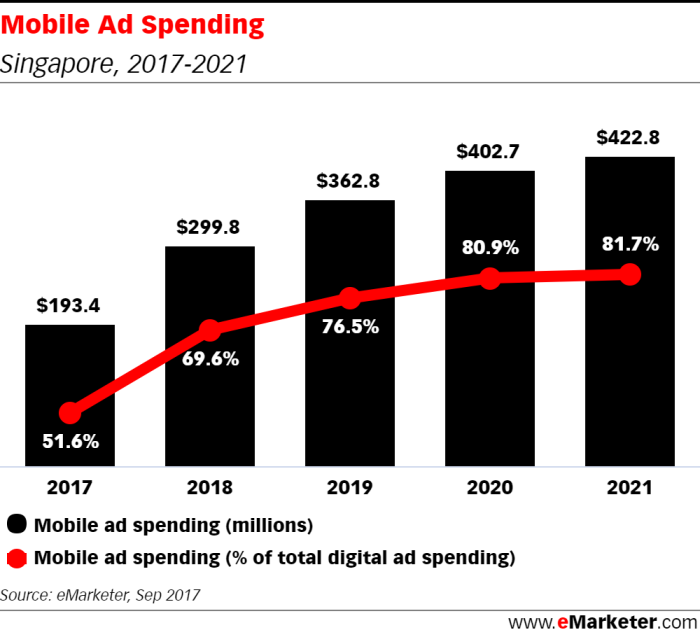 The report added that digital ad spending in Singapore, Malaysia, Indonesia, Philippines, Thailand and Vietnam is “poised to swell” as a result of heavy mobile investments across the region. This will see double digit increases in digital ad expenditure in 2017 and 2018. The report added that mobile ad spending in these markets will more than double during the forecast period. This will surpass US$2.20 billion and account for nearly 69.0% of digital ad expenditures by 2021. The study found that in Singapore, overall media growth has slowed slightly in recent years due to weak consumer spending. However, as the economy recovers, eMarketer is forecasting to see increased outlays on digital, which is predicted to account for almost a quarter of total ad spend in the country this year at 23.8%. By 2021, digital ad expenditure is expected to tally to around US$518million, of which mobile will account for 81.7% of digital ad spend. In Malaysia, overall media spend growth will also slow slightly from 1.5% in 2017 to 0.5% in 2021. However, digital ad spending is set to rise from 19.74% of total media ad spend in 2017 to 26.31% in 2021. 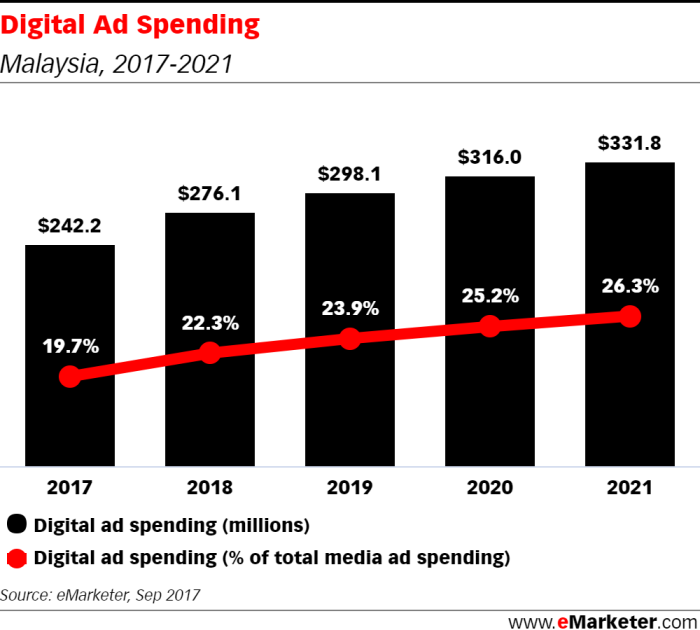 By 2021, digital ad spending is expected to tally around US$332million, of which mobile will be around 75.21% of digital ad spend. 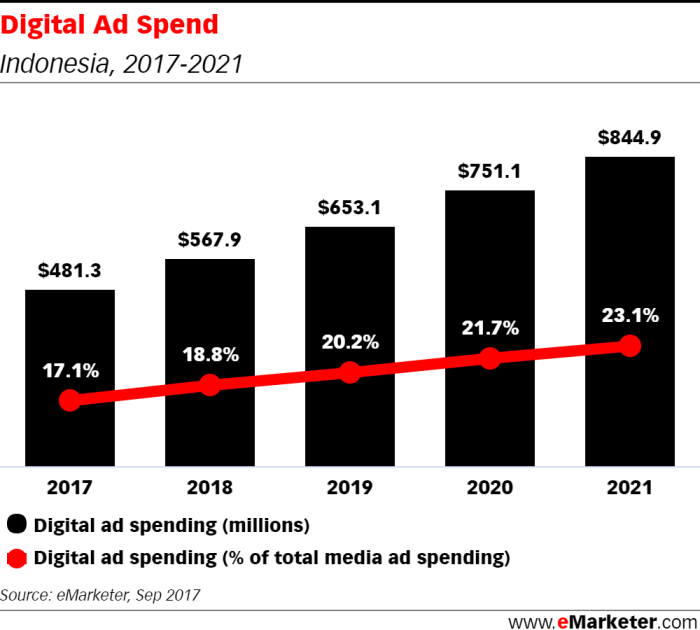 Meanwhile in Indonesia, overall media spend growth will stay consistent at around 0.48% over the forecast period. Digital spending will rise from 17.11% of total media ad spend to 23.05% in 2021. By 2021, digital ad spend is expected to tally around US$845million, of which mobile will be around 62.39% of digital ad spend. 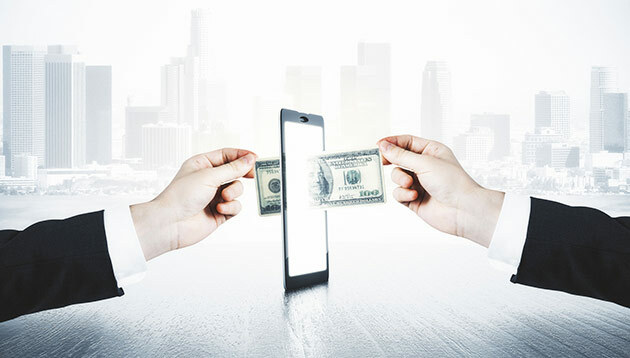 The study added that Indonesia, Philippines and Vietnam will see the strongest growth in mobile ad spending due to heavy smartphone adoption, Indonesia will increase outlays by 80.0% while both the Philippines and Vietnam will double their mobile ad expenditures this year. Most digital and media industry players Marketing spoke to found the eMarketer report findings are consistent with the different behaviours observed in the region. Jean-Marc Thomas, head of digital at Carat Asia Pacific added that ad spending in digital, and especially in mobile, will keep growing as more people will use their devices to purchase services and goods. “The digital economy in the region will keep flourishing thanks to an ever-increasing internet penetration, even if e-commerce is still relatively small compared to the total retail sales. But populations who do not have access to large retail store or brands will be purchasing through their devices,” Thomas explained. Andrew Stephens, CEO, Ambient Digital Group, added in emerging markets such as Vietnam, Indonesia and Philippines, digital ad strategies from key industries such as banking, e-commerce, telecoms and FMCG companies will continue to fuel digital advertising spend. This trend will be seen across the region as traditional media continues to decline. However, a key reason for slowdown in media growth in Singapore could inherently be due to a smaller population, and fewer emerging middle class. On the other hand, developing countries such as Vietnam, Indonesia and Philippines are seeing a rise in the emerging middles classes, and will inadvertently boost consumer spending. For RP Singh, regional head of media and content, VML SEA & India, while the figures are heartening, they are not necessarily surprising that digital spend will be largely driven by mobile. This is because as a region, the idea of being mobile-first has been a long held notion. How should you allocate your media spend? When it comes to allocating your media budgets, Singh said the golden rule is to look where digital consumption takes place and then follow. However, this does not mean that spend should entirely be about mobile. He explained that while there are some in the industry who would claim that as a region it is not just mobile-first, but “mobile only”, marketers need to “resist taking these pundits at their word”. “There must be a balance, and mobile should always be part of an integrated campaign that includes both digital and offline channels,” Singh added. Thomas said that the Southeast Asia region is fragmented, as such, there is no “one solution fits all” approach. Furthermore, brands should not forget the local cultural nuances, because they are targeting consumers, not only media platforms. “You need to understand the differences in terms of infrastructures, local economy and market size, consumer media habits, mobile ownership, internet penetration and usage to be able to customize each of your campaigns at the country level,” Thomas explained. “The developing economies of Southeast Asia are well placed to become Asia’s next top-ranking digital advertising growth markets as these economies reap the gains from a ‘development catch-up’ with favourable demographics, increasing smartphone adoption, expanding internet access and declining data prices,” Shelleen Shum, eMarketer senior forecasting analyst, said. Shum added that e-commerce will be a key driver in the years to come as investments from global giants pour in to shape Southeast Asia’s e-commerce scene. In February this year, eMarketer released findings from a joint report it did with IAB Singapore for a digital spend forecast for Southeast Asia, Hong Kong and Taiwan. The report predicted a double digit growth in 2017, a result of growing consumer demand for mobile, video and social. "Key traits of a top marketer are very similar to a top businessperson"
"The use of contactless card payments is increasing, but there are significant barriers to adoption of digital wallets." ..